Need I say more?? 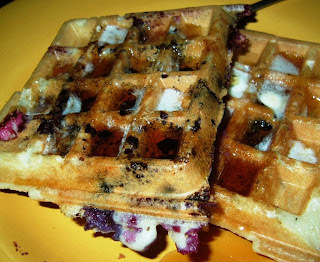 Don’t limit your blueberry breakfast to pancakes when you can have waffles just as easily! I don’t have a waffle recipe. I used a mix and then added fresh blueberries and cooked as usual. This is a delicious and nutritious breakfast and a fun way to use blueberry in a different sort of way. 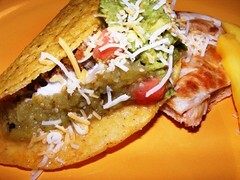 Back together in the kitchen again, Mimi and I made fish tacos (fried flounder) and crab quesadillas. As toppings we had fresh guacamole, home made salsa verde, and fresh mangos and tomatoes. Nothing hard about his meal, but it sure is delicous. Hopefully we’ll get a couple of more chances in the kitchen together. For sure if we do, we’ll be well fed! I decided to try something new. 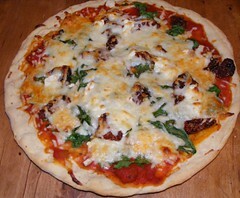 It has been a while since I had the time to do do that, so it was nice to get into the creative spirit of cooking. There are two good bean burgers in town. One is at The Distillery. 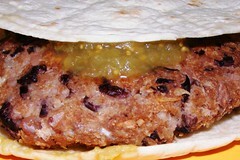 They serve a black bean burger which is tasty but huge! B. Matthew’s has a black-eyed pea sandwich which is very good. I decided to take what I could remember of the flavors of each of these and this is what I came up with. in food processor put about 1/2 a medium onion and 2 cloves of garlic and then blend until well mixed. Add black beans to bowl and then mash them to a paste – I did it with my hands you could probably put them in the food processor as well, but I wanted them to retain some of their bean quality. Mix in the onion and garlic and one egg. Add bread crumbs (I used panko) until the mixture holds together well enough to make four patties. I probably used about a 1/2 cup. Season the mixture with about a tsp of salt, a tsp of cumin and a few dashes of your favorite hot sauce. I put the patties in the freezer for about a 1/2 hour just so they would hold their shape. To keep them healthy, I decided to bake mine. I put them on a greased cookie sheet and baked them in a 350 degree oven for about 10 minutes per side. I served them with fresh made guacamole. I didn’t have any buns so I put them in a flour tortilla and decorated it as one would a taco. I am definitely going to try these again – they were very delicious, healthy and super filling! Form into a ball and let it rest for 5 minutes. Form to greased and floured pizza pan and cook for 7 minutes (you don’t have to do this, but I like a crispy crust and this works for me) add sauce toppings and cheese and cook for an additional 10-12 minutes. When I returned from vacation, my basil had been working over time. Nothing better than whipping up a batch of pesto when this happens. Actually the night prior I made a batch of bruschetta which is another great way to use basil if you have extra on hand. I make a pretty traditional pesto. Blend together about 2 cups of fresh basil, 2 cloves of garlic, about a handful of pine nuts, 1/3 cup of Parmesan cheese and while blending, slowly add olive oil until it is well blended, but not oily. 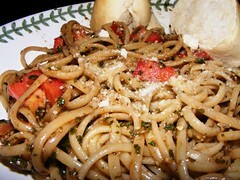 Boil favorite pasta – I used linguine – add chopped tomatoes and feta cheese and enjoy with a hunk of fresh bread. It doesn’t get much simpler or much better than this.